The Nikon Z mirrorless system is an entirely new camera designed around an entirely new mount. The Nikon Z Mount is the first new mount design since the F Mount in 1959. Mirrorless cameras allow a much closer flange distance between the rear lens element and the image sensor since there is no mirror box. This offers many design advantages – with the development of SLR cameras in the mid-twentieth century, that distance for mirror clearance was actually a problem that had to be solved in the lens design itself. Leica had an advantage with the rangefinder design and there’s many classic lens designs that just can’t be done for an SLR camera. Moving forward this requires an entirely new lens lineup which is simply not possible with the release of the Z cameras. Nikon have given us 3 native lenses to start with. 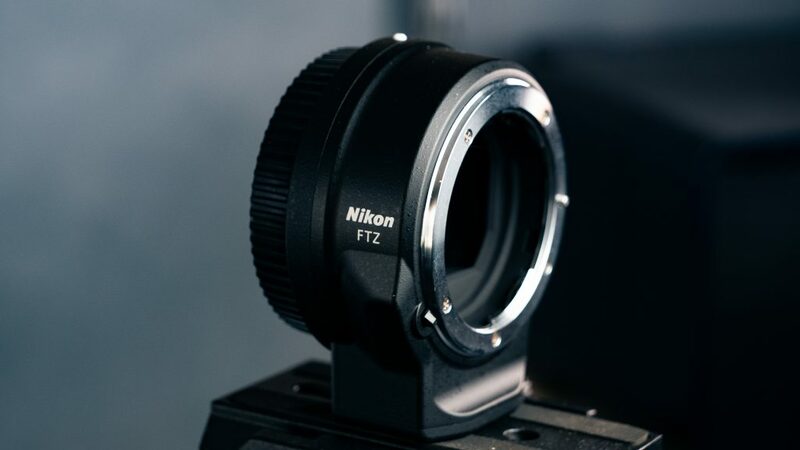 To bridge the gap, they’ve also developed the Nikon FTZ adapter so you can use older lenses with the Z cameras. While adapting certainly works and gives you access to a wide range of lenses, its not perfect. Nikon’s older lenses used systems used an aperture ring stop on the manual focus lenses (AI, AI-S and Series E). The Nikon AF-D lenses relied on the autofocus motor being built into the camera body. So basically there are lenses that will mount, but you’ll loose Matrix metering and or autofocus capabilities. I would speculate price was a huge influence in the final design decision of the FTZ adapter. Nikon have generally been very open to backwards compatibility, but to include motors and aperture stops just to support legacy lenses would have made it very expensive. It would have also been much larger and complex with internal drive motors. In short, you’ll want to use newer lenses anyway. I also want to note that my experience with lenses will vary in terms of speed and ergonomics. DSLR’s were originally designed for single image capture. Mirrorless is able to potentially autofocus in near-real time so lenses with rotational motors are problematic. Lens to lens will vary, but speed and noise can be problematic in some lenses. The following are the various Nikon F lens types and how they will work on the Nikon Z cameras with the adapter. These are the most modern of the Nikon F mount lenses and all will have complete functionality on the Nikon Z cameras with the Nikon FTZ adapter. Note however, as I mentioned earlier performance varies lens to lens depending on the type of motor being used etc. Teleconverters are compatible. I’ve not tested any as of this point, but theoretically they work fine. AF-D lenses are dependent on the motor built into the camera body. The Nikon FTZ adapter does not have a motor so you will lose autofocus functionality. Everything else will work fine with full EXIF communication, but these lenses become manual focus only. You will have feedback from the camera for all rangefinder-type autofocus aids. As with the AF-D lenses, the AF lenses are dependent on an external motor. They will mount, but you won’t have autofocus. You do have EXIF communication, but unfortunately no focusing aid support. These are manual focus lenses natively. They will mount with EXIF communication but you will loose focusing aids and any distortion control. The earlier manual focus lenses were dependent on a mechanical lever that controlled the release of the aperture ring. This lever was not built into the Nikon FTZ adapter. These lenses were all pre-EXIF so there is no data for communicating with the camera. You can call up the focal length and aperture from the camera menus for the EXIF data (in other words only what lens your using, not the actual aperture used in the photograph). These lenses mount as WYSIWYG type lenses. The aperture stops down and you’re always viewing at that exact aperture. You will loose matrix metering so you’ll need to make adjustments for exposure manually. You can use focus peaking. I do want to note that the age of these lenses will show on this system. They were designed to project light onto film, not a high resolution electronic sensor. They’re just simply not as sharp as their modern equivalents. I only recommend these if you’re super nostalgic or just being cheap. If its the latter you’ll get way better results using film. I haven’t tested these yet, but assuming there’s no mechanical reason why it won’t mount (be very careful) – they should work exactly like the other AI, AI-S and Series E as described above.